Beneath its placid and gentle exterior, the Persian has a very typically feline nature. It adapts well to new surroundings, is a good traveller and ideal for showing: it seems to enjoy being the object of so much admiration! The Persian makes an excellent companion, for it is restful, pleasant to stroke, calm and quiet - although quite independent. Its miaow has a very melodious sound. It is affectionate and likes being with people, but it may not always be demonstrative. It is one of the best natured of cats, extremely good tempered until teased. Usually very tolerant with children, playing with them gently with "velvet paws". 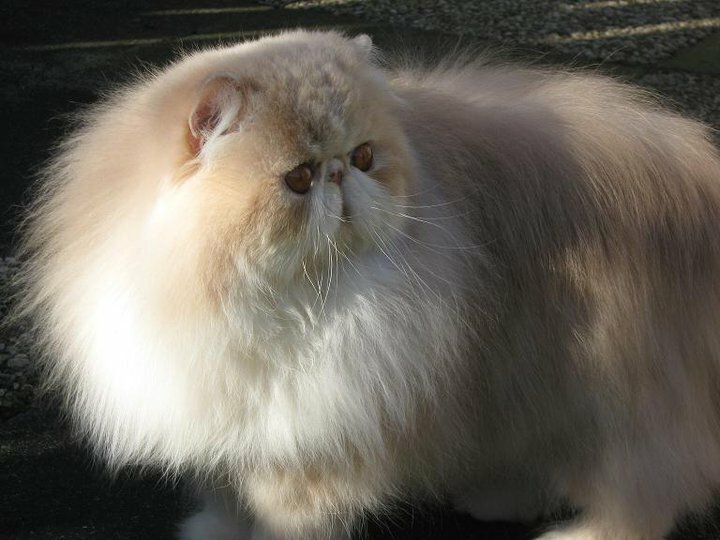 Although quieter and generally less adventurous than its shorthaired cousins, the Persian enjoys running and jumping which helps to keep it in fine shape. Some may also hunt mice. They are not pugnacious as a breed, and will live companionably with other animals. The Persian likes company, human and animal, but will very often avoid those who are unfamiliar. When a Persian goes outside, it may not always come back easily or willingly, however, as it does everything in its own time. It will happily live its whole life indoors, even in a flat, provided it has the run of the place and plenty of fresh air. It will not fret if left alone, but will probably sleep most of the time. The Persian really enjoys being groomed if a regular grooming pattern has been established at an early age.